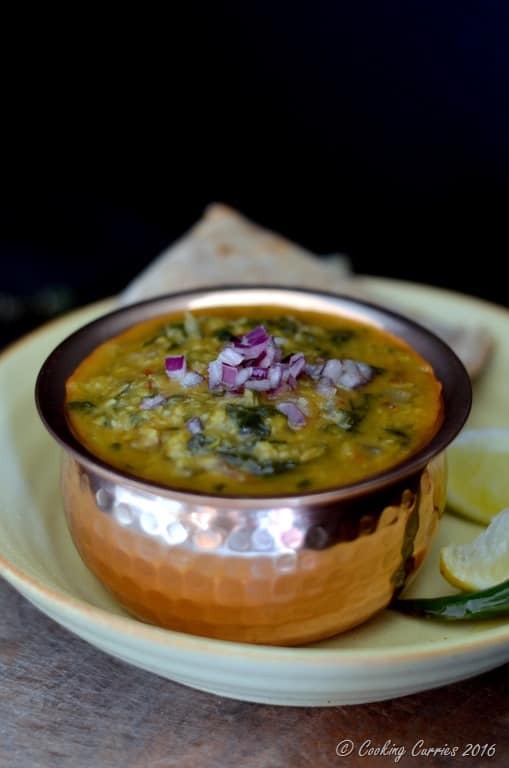 Hearty moong dal with the goodness of spinach along with a touch of ginger-garlic and spices, makes this a comforting bowl for any season! Simple things are sometimes the most comforting things in life. Same goes with food too. Simple food is more often than not, the most comforting. It is either a memory or some warm feeling you get from eating it or just that the heartiness of it wraps you up in a huge good good hug! Dal always takes that place for me along with a curd / yogurt rice and spicy pickle. I most always make a dal and some plain rice as soon as we get back home from a vacation, especially if it was a long flight. Nothing cures vacation hangovers, jet lag and tiredness like good old comfort food. And the bonus is that they are almost always easy to make. 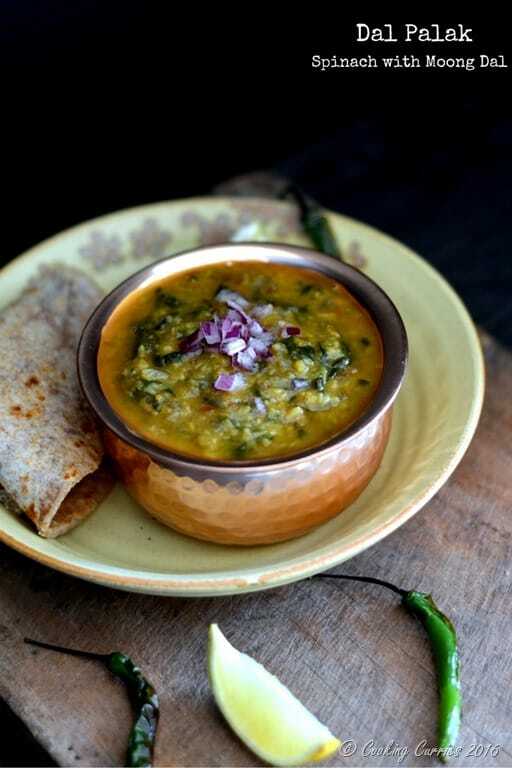 This palak dal made with spinach and yellow moong dal is a two-in-one meal. 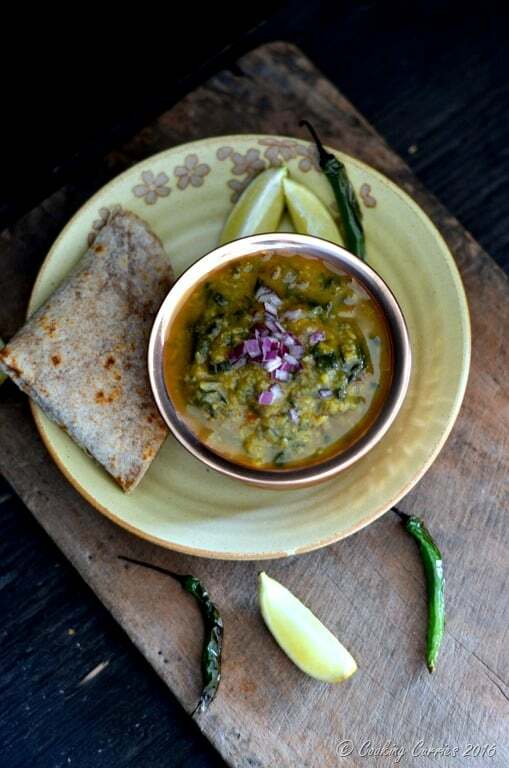 We usually have a dal or some other saucier curry and one dry vegetable curry along with rice or rotis. That is just how it has always been, except for lazy days when it is just one or the other. 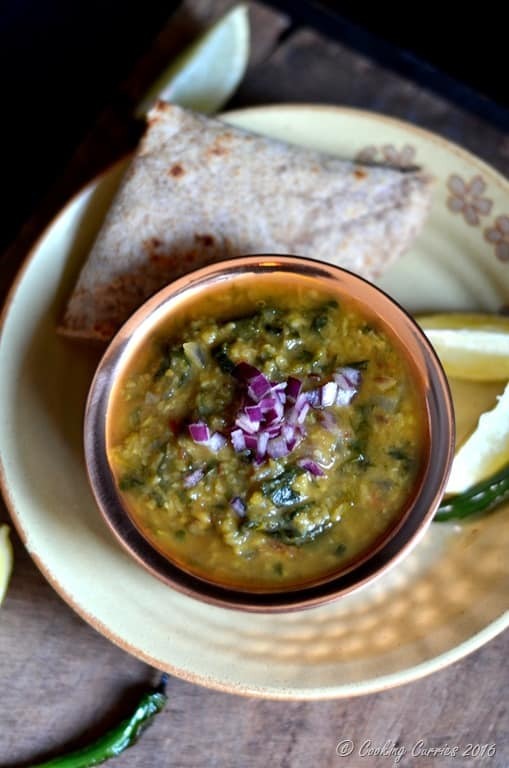 This dal has some spinach in it, that kinda takes the guilt away from not making a vegetable sides on one of those especially lazy days. The kiddo loves it too, which is a bonus. It is one of the few food with any green leafy vegetable in it, that he does not make a face and say “leaf!” and move it away from his plate. Yup, the good eaters get picky too, sometimes! 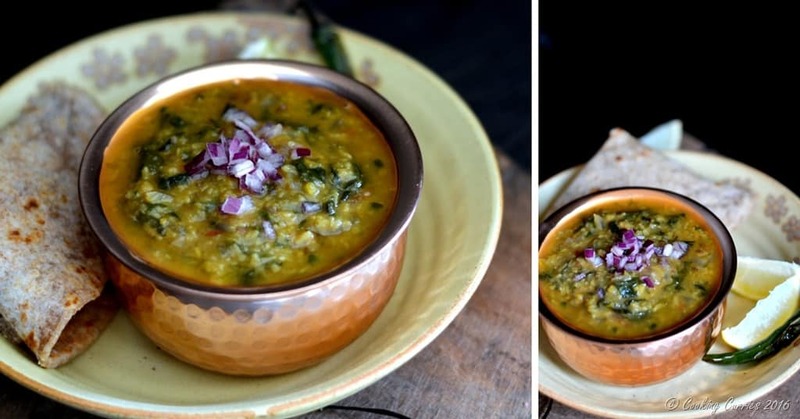 Without further ado, here is the recipe of one of my favorite dal preparations – Palak Dal! This recipe is adapted from the YouTube channel Food Junction. 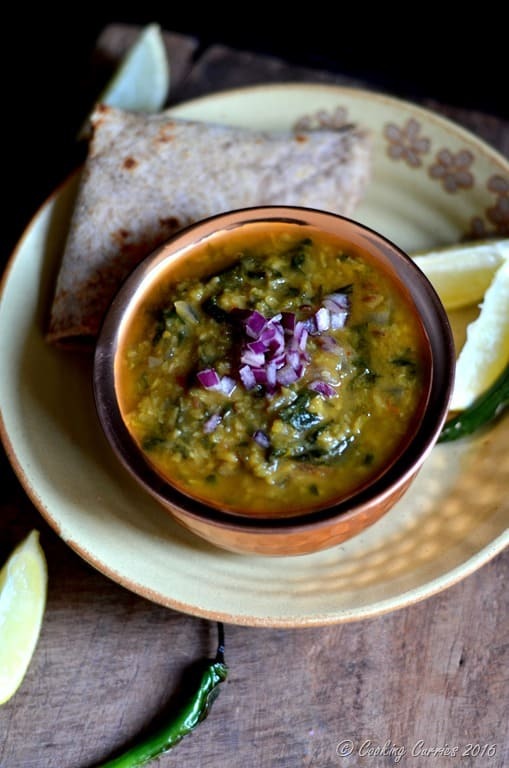 Wash and cook the yellow moong dal with about 2 cups of water until mushy. Keep aside. Heat the oil in a kadhai or heavy bottomed wide pan. Add the cumin seeds to it. Once they sizzle, add the onions, garlic and green chillies and sauté till the onions soften and turn to a light brown color. Now add the shopped tomato along with the turmeric powder, cayenne and coriander powder. Add salt. Sauté till the tomatoes soften. Add the spinach to the kadhai and let it wilt completely. Keep cooking for a couple of minutes more. Now add the cooked dal to this. Add more water, if needed. Cover and cook for a few minutes until the dal, spinach and the onion-tomato masala comes together. I love your blog. The recipes are amazing and the photography is beautiful! That looks absolutely amazing and your photos are stunning! I would love to enjoy this meal! You know, dal is such a perfect meal because it has so much protein. Being a vegetarian, I am always looking for ways to increase my protein intake. Your dal recipe is going into my recipe book now. Yes! This is the perfect combo of greens and protein!! Your photos are so gorgeous I just want to reach through the screen and try a bite! Easy recipe to follow especially as someone that is learning to cook Indian food. 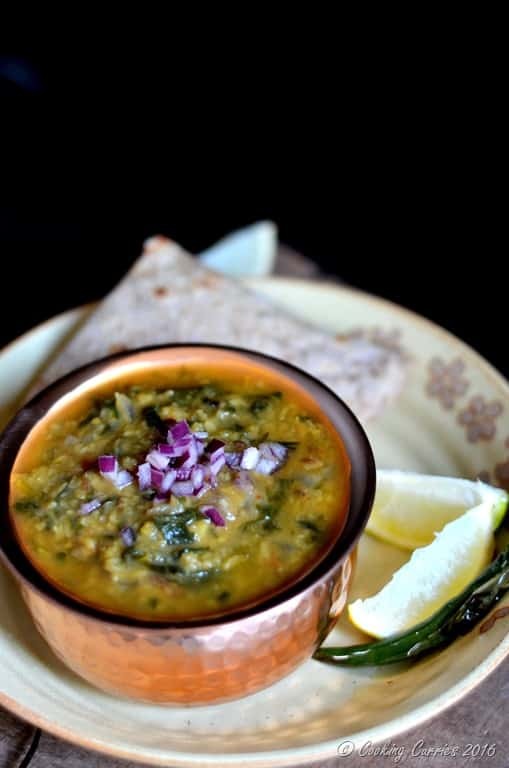 Absolutely delicious and I love that you added palak to the dal! Will be adding this recipe to my rotation of weekly meals! I made this just now and had some with toasted homemade bread… Delicious! I used skinless split mung, and maybe a little less red onion than you called for, and a little more garlic. I had an orange tomato, and cooked the onion-garlic-pepper mix not as long as you suggest, so the tomatoes were soft but things were still a little chunky. The color was wonderful; a shining florescent yellow with orange, green, maroon and white flecks, and the spinach leaves swimming in the mix. I also skipped the coriander and used half as much turmeric. The whole meal, from opening the bag of mung dal to sitting down took maybe 15 minutes. This recipe will definitely go in my “repeat” rotation. Thank you!